My husband was out of town for three weeks. Things always go sideways when he’s gone. Part of it’s just the normal life stuff that suddenly seems overwhelming when handled alone and part of it’s stuff he normally takes care of that’s now added to my shoulders. But some of it’s special and over-the-top. A kid with a persistent cough that kept everyone up at night. Cleaning up vomit from the floor of the car when said kid coughed so hard, he made himself throw up. A mystery come-and-go ailment with the older boy that came on suddenly with headache and sore throat and left the boy curled up lifeless in the recliner. A trip to the doctor’s office, 2 strep tests, 1 flu test. All came back negative, thankfully. Constant fighting to get kids to take medicine that they don’t like the taste of. Zig Zagging all across town to taxi 3 kids to or from 5 different activities in the course of a single evening. Dead mouse stuck to the floor at the head of my bed. A terrible rotting smell in my daughter’s room most likely the result of the animal that we thought we heard trapped in the wall dying. How does one extract a dead animal from a wall when you don’t even know for sure which wall? Dog that has now decided the neighbor leaving for work at 4am is objectionable and barks to show her displeasure. February started. This means I had to try to setup the next month’s budget on my own while pinging my husband, who was away and busy, to do one little piece. I think we were a week into the month, with me trying to save receipts, before I was ready to fund our envelopes in the GoodBudget app. One kid managing to get both big toes infected due to excessive ripping off of toenails (rather than using clippers) that has left him with ingrown nails and pus seepage. This means me washing his toes nightly, spraying with peroxide, applying polysporin, and covering them. He’s getting to be a big boy. His feet are nasty. Basketball coach forgetting to add me to her contact list resulting in me showing up with my excited Kindergartner at the local frozen yogurt place, only to learn the date had changed. Fortunately into the future, not the past. Me calling my husband and chewing him out for not forwarding that communication on to me. Him getting his feelings hurt. Me attempting to apologize. Four pairs of school dress code pants being pulled out of service due to massive rips in the knees. Two more lost their buttons. It’s a wonder the boys aren’t attending school in just their underwear. Teenager poor decision making on Instagram followed closely by teenager lying, my dramatic (albeit temporary) conflict with another mother, confiscation of the iPod, worries about her social standing, stress, and nervous breakdown. Flooding of the laundry room when I forgot to feed the temporary drain out the window before starting a load, most likely due to distraction caused by the stress of the Instagram debacle. Throwing a laundry basket across the room in frustration after seeing the water and watching it fly toward a shelf of pottery, muttering pleas for it to drop before causing damage. Breaking several of my daughter’s crosses when I rushed into her room to grab the two towels I had seen on her floor, only to learn as I snatched them off the ground that one was cradling the fragile crosses that had been temporarily removed from the wall. Displaying incredible maternal fortitude by collapsing in front of the laundry room with the recently acquired towels, curling into a fetal position, balling my eyes out, and crying, “I can’t do this by myself” – all in front of my boys, who sweetly offered to help, not understanding what “this” was. It’s times like this that I truly admire the real single parents of the world. To do this 24/7/365 takes incredible energy and dedication. Even doing it badly can take more than you’ve got to give. The first week was the hardest. It got easier but I still can’t imagine doing it for the duration of a childhood or two… or three. Fortunately, my husband returns tomorrow. Because I’m insane, I’m trying to surprise him with some completed projects around the house. As if surviving with all three kids intact isn’t impressive enough. “How was school today?” I ask Jane after picking her up from a friend’s house one recent school evening. “Um. Yes, mom. It does. Instagram and Twitter are how you find out when new albums are coming out.” (This is said in that “you just don’t get it” teenagery tone). “No, it means it’s being played on the radio.” (She’s starting to sound irritated). “Yes, it does mom. They don’t play bad songs on the radio.” (Now we are dangerously close to an explosion). You see, we were having two different conversations. I was having one about logical deduction, trying to get her to see what counts as proof and what doesn’t. I was trying to get her to think scientifically. To consider what minimum information can be gleaned from the evidence gathered. To look for other explanations for the data. She was trying to build a case about why her favorite band is this generation’s Beatles rather than New Kids On The Block. And, in her mind, I was tearing that down – trying to prove her wrong. So she was getting frustrated. Having recently learned my lesson, I chose to acquiesce rather than continue the one-sided logical analysis I was attempting. I mean, I may indeed think that One Direction is more like NKOTB than the Beatles, but that truly wasn’t the point I was trying to make. There is no point in employing logic when planning with a teenager. It is lost on them that two people that are 2 1/2 hours from a given location are not necessarily close to each other. They could, indeed, be a solid 5 hours from each other. And when only one or two of these people can drive, it seems unlikely that parents would be willing to drive them somewhere to meet another kid from camp. As she named the towns they each lived in, I found it unlikely we could make this get-together work. But I am a loving and devoted mother who wants to give my children what they want when possible. So I first said to find out who was available on that particular Saturday and who was able to travel. She crafted the text request in such a way that no one answered about whether they were able to travel any distance away from their homes. One answered that he would be taking the SAT in the morning but was free after. One said maybe. One said yes. One said no. The local girls, who would be transported with us wherever we went, said yes. So I said, “Ok. Tell them that we are going to have your party somewhere at 3:00 Saturday afternoon. We will pick the somewhere to be as accommodating as possible for the people who are able to come. See who can be there at that time.” Same answers. So then I checked a map. I already felt like I was having to pull teeth to get any decisions made on this get-together. After studying the map, I picked a town that was just over an hour from us and also from each of the two yeses. It would be a longer journey for the maybe, but maybe he could get to the guy closest to him and catch a ride. “I’m done with this conversation,” I said, and walked away. Her notion of space is weak as the chosen town is not in the area she described. After getting dinner in the oven, I tried again. “Jake can’t come. He says it’s too far,” she said. I bit back the urge to point out which one of us had been right about the need to share the location with people. I merely asked her to confirm with the other person whether he could travel or whether we should travel to his town. “Basically,” I said. But surely one of these friends would be better than none? I told her to give the boy my phone number so his mother could call and talk if need be. Several days went by with me pinging her each one. By Wednesday, I still didn’t know what we were doing. It distinctly felt like everything was falling apart. Finally, the boy responded. His mother said it was too far away and reminded him that he had another party to go to that day anyway. Ok. So now what? She fretted over not being able to get people together for her birthday. She mentioned a popular girl at school that had dozens at her party. I said the quantity of people at the party was not nearly as important as how much they mean to you and vice versa. She seemed to be getting down. Finally, she named a science museum she wanted to take her local girlfriends to. I stayed home with the boys. My husband took the four girls and dropped them off at the museum while he checked out a nearby art museum. Then he took them to her chosen hamburger joint and a Hot Topic, where they got matching shirts. One of them then spent the night. The next day, I delivered her to a movie theater that was showing the “one weekend only” One Direction concert movie. She didn’t take any friends because none of them are One Direction fans. Just her. All in all, I think she had a good birthday. But it was looking kind of sketchy there for a bit. Jane is responsible for doing her own laundry. She’s not particularly good at it. I’m sorry, I’m just being honest. She’s not. I’ve been told it’s rather common for folks her age. They stink. At doing laundry, and as a natural consequence, sometimes literally as well. A little while ago she declared that she needed a second laundry hamper. She needed it to transport the clean laundry back to her room. You see, I have a hamper that serves to transport the clean laundry from the laundry room to the living room to be folded and she felt she needed the same luxury. I said that she would just use it to store the clean clothes, as she was already doing with the single hamper, piling the dirty laundry on the floor. She insisted she wouldn’t do that. I recommended a collapsible hamper for her clean laundry transport, arguing that her room wasn’t big enough to hold two hampers. This way, during those mythical times when the laundry would be folded and put away, the hamper could be too. She didn’t want a collapsible hamper. Any guesses which pile or hamper has the clean clothes? She left for summer camp Sunday. Saturday morning, we were having them pack so they could tell us what they needed us to pick up at Wal-Mart. She told her Daddy that she needed socks and underwear. He looked at the scene above. “Isn’t this a pair of underwear?” he asked, picking up an article. She then tried to convince me that the two towels in her room were clean because (I quote): “I’ve done laundry twice this month and they were in the first load I did.” I managed to get clarification that she hadn’t used them since then which answered the question of where all the towels have gone. She later went off on how she didn’t know where her Kansas City Royals hat was. “It always sits right here on this shelf,” she claimed. After she left, I braved her room to look for her volleyball shorts. I thought they’d serve well as compression shorts under my hockey pants. I foolishly looked in the chest of drawers first. That’s where she keeps the clothes she can give away in a garage sale. Oh, and a bunch of non-clothing items. Oh, and that hat. The one that *always* sits on the shelf. I eventually found the shorts in the pile on the floor. They smelled clean, I guess. So the stuff on the floor is clean? Put all your dirty clothes in our hamper and we’ll get them washed and folded for you. I mean, what kind of a kid passes up an opportunity like that?! Shoot! College kids lug their clothes to their cars and haul them home for that. All she had to do was walk across the hall. The only clothing article of hers in our hamper is that pair of volleyball shorts I borrowed. 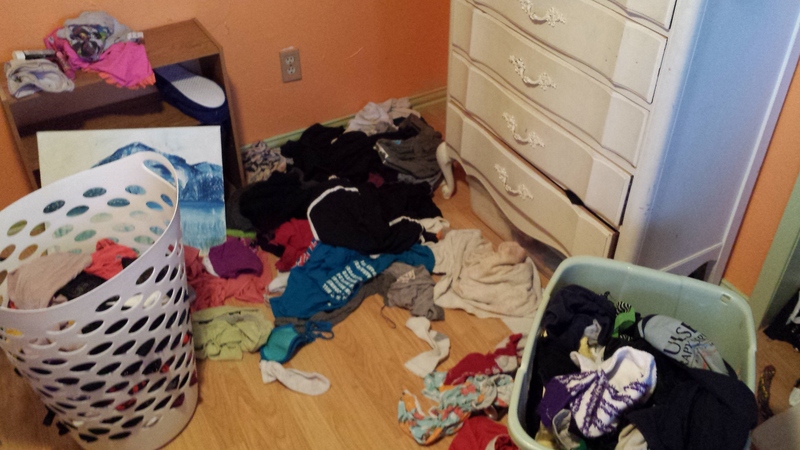 So now I wonder if I just wash all those clothes in her room or maybe pick through the piles to determine what smells bad or just wait and let her sort it out, risking her proceeding to the next camp smelling like a dumpster. That last thought is winning the day so far. I’ve spent enough time folding everyone else’s laundry. If she can’t at least deliver the clothes to me, maybe I don’t need to hassle with it either. My daughter continues to impress me with her high opinion of my physical appearance. On a whim and with no small amount of encouragement from her, I bought some “light auburn” hair dye this weekend. I’ve never dyed my hair before. Ever. I’ve contemplated it but was always content with the color God gave me. I had been remarking on the increasing number of gray hairs on my head but that’s not why I bought it. I think I wanted to do something spontaneous (a tame midlife crisis?!) and I think I wanted to do something for my husband (he really likes red heads). Anyway, I bought it. But I wasn’t in a hurry to use it. When we went to get my husband’s opinion, he too remarked at the inability to see the red very well (my natural hair color is a very dark brown). Jane insisted that I looked great. “She’s just saying that because it covered all the gray,” I said. “That’s not true!” she protested, indignantly. “You can actually still see some gray right… here,” she continued, picking at my hair. Our 13 year old daughter has several chores that earn her right to her cell phone. We’ve gone over what those chores are several times. I’ve walked her through them. Like, literally, stood in the room with her, told her what types of cleaning solutions to use for which chores, whether to use paper towels or a washcloth, how to not forget certain easily missed areas, demonstrated particular cleaning techniques. It has been explained. So last night, after being told to clean the bathroom, she told her dad that she had done so. He didn’t check her work right then but commented to me later that we needed to (since we have long suspected that she’s not doing her chores or at least not doing them well). So I did this morning. They had already left for school so I called her. “Yeeeessss,” she said, as if confused as to why I was bringing it up. I was afraid that my last question had come across too strident and we would now engage in the indignant screaming match where I would be accused of not appreciating anything she does and it’s not her fault if I can’t see all the work she did. Either that or this kind of baffling exchange: you didn’t sweep the floor _ yes I did _ then why is there visible dirt? _ I don’t know because I did sweep _ no, no you didn’t _ YES I DID! _ then you didn’t do a very good job _ I don’t know what you want me to say! I SWEPT THE FLOOR!! She took a different approach. I choose to refer to this response as Selective IQ Deficit: the sudden apparent decrease in a child’s IQ to justify failure to accomplish an assigned task. She should know that “clean the bathroom” does not mean to put the toothbrushes back in order and line up the cups and soap dishes. When I told her that she would need to actually clean the bathroom this evening before or after volleyball practice, I finally got the explosion I was expecting. Only I wasn’t expecting it anymore. After some very confusing back-and-forth, I found out that the school board wanted to recognize some academic award winners. Lots of people miss this. There’s no reason for her to miss volleyball practice for it. But she was enraged that we were going to make her stick to her original commitment. Whatever. When I got off the phone, I noticed that her 10 year old brother, fully dressed for school, had really greasy hair. I called Daddy. He agreed there was enough time to not be late for school. I hung up and turned to my son. To my surprise, he walked to the bathroom without complaint. I opened the bathroom door. He was at the sink. “WHAT??! !” Yeah… there’s the reaction I was expecting. I checked on him later. The sides of his hair were not completely wet. He was trying to lather the shampoo while standing under the stream of water. He was only washing the top. I reached in to help him out. He indignantly exclaimed that he knew how to wash his hair. Indeed, all evidence points to the conclusion that my children will never grow into fully functional, productive, responsible adults. I’ve been assured that they will, but times like this… I have serious doubts.